After more than a decade Argyle Park is now well-developed as a show-piece alpaca stud, able to welcome visitors interested in a 'hands-on' experience with the alpacas. There are around 100 alpacas and a small flock of Dorper sheep on the property, together with a few chooks, many birds and rather too many rabbits. The kangaroos and a couple of wallabies 'come and go', and share the pasture without too much problem. The many kilometres of native trees seeded in the late 1990s have grown to 5-15 metres, and have greatly improved the property. Visitors are welcome to enjoy beautiful walks to see the birds in these trees, especially along the gully areas and around the lake. Picnic and toilet facilities are available to visitors, as well as boiling water for a complimentary cup of tea and coffee. The property is particularly suitable for horse riding, and visitors are welcome to bring horses to ride over several km of gently undulating scenic and quiet countryside. There is no extra charge beyond the standard $15/car. 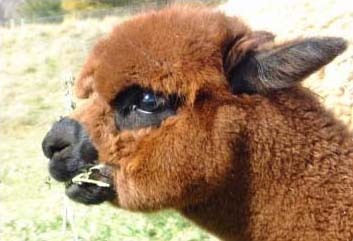 Especially attractive to visitors of all ages are the endearing alpaca babies. Called 'cria', the infant alpaca is quite advanced after its long gestation of nearly 12 months, and is usually up and skipping around shortly after birth. Interestingly, birthing almost invariably occurs after daylight during the morning. (Wouldn't it be handy if humans could do this!) This characteristic appears to be genetically ingrained, as in the extremely cold night-time temperatures of their high Andes homeland the cria would probably die if exposed while wet. Alpacas don't lick dry their newborn cria, which also usually has a transparent membrane that quickly dries and hardens to form a clever protective 'coat' against chilly winds while its short fleecy coat dries. 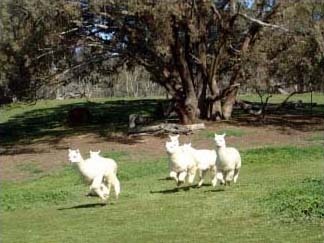 While concentrating on white fleeces to meet customer and processing preferences, Clearview Alpacas also aims to reproduce the extraordinary natural colours that are unique to this animal. These range from the popular white and light fawn through the darker fawns, browns and greys to the only true black commercial natural fibre. Visitors can feel for themselves how garments made without dyeing retain a wonderful softer and more luxurious feel. Active in support of local Landcare, we've used a tree seeder to very good effect since 1998. We sowed the 'Boorowa mix' of some 40 native tree species from John Wetherstone of Gunning along some 10km of tree-lines fenced off along several gullies on the property. This has resulted in many tens of thousands of eucalypts, wattles and native shrubs now up to 10 metres high that have transforming the habitat for many bird species at Argyle Park. We're especially delighted to see the beautiful Superb Parrots regularly visiting in the late afternoons during late Spring and Summer, joining the numerous Crimson and Eastern Rosellas on the property. Only 5 km from the Hume Highway and just 10 km from historic Yass's picturesque old hotels and modern motels, Argyle Park has sealed road access to the front gate. The property is only 40 minutes drive from Canberra, 3 hours from Sydney and 5 hours from Melbourne. Visitors by car or tour bus are welcome to see the quiet and gentle alpacas, feel the fleece and many alpaca products always on display, enjoy a complimentary cup of tea or coffee, and take a walk to see some of the many native tree plantings. The walks are easy for children, and can be as short as a hundred meters up to a kilometer or so. Simple picnic facilities are also available, and the whole property is suitable for horse riding for those who would like to bring their own mounts. There is reasonable access for disabled persons to the nearer attractions - though the toilet is difficult for wheelchairs. The small Clearview Alpaca Shop offers a good range of alpaca clothing and homeware products, including knitting wool spun from Clearview’s own alpacas. There are also beautiful photograph cards showing local bird life by acclaimed Canberra photographer Helen Fallow, a frequent visitor to Argyle Park. $15/car. Tour buses: $5.00/passenger. Complimentary tea, coffee and a biscuit. All visits are by appointment, except during our advertised free open days. Please ring 02 6227 6147 or use our Contact Us form.